For the life of me I can’t recall if I have already sent out the notice of Saturday’s Run/Walk. If I did, ignore the duplication. This week: Meet at Panera. 7AM as usual. (Park Here) We should note that our summer was so mild that we never started a run at 6AM because of the heat. It is doubtful if we will do so anytime soon. Coffee at Panera. 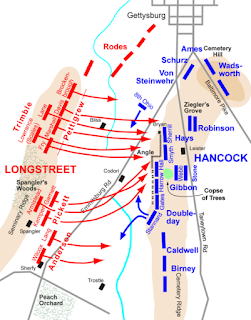 Tom A. and I will run norther part the battleline of the Army of Northeren Virginia and then east across the fields duplicating Pickett’s Charge scans incoming fire about the same time.